I decided to do another project to take to Burningman this year. 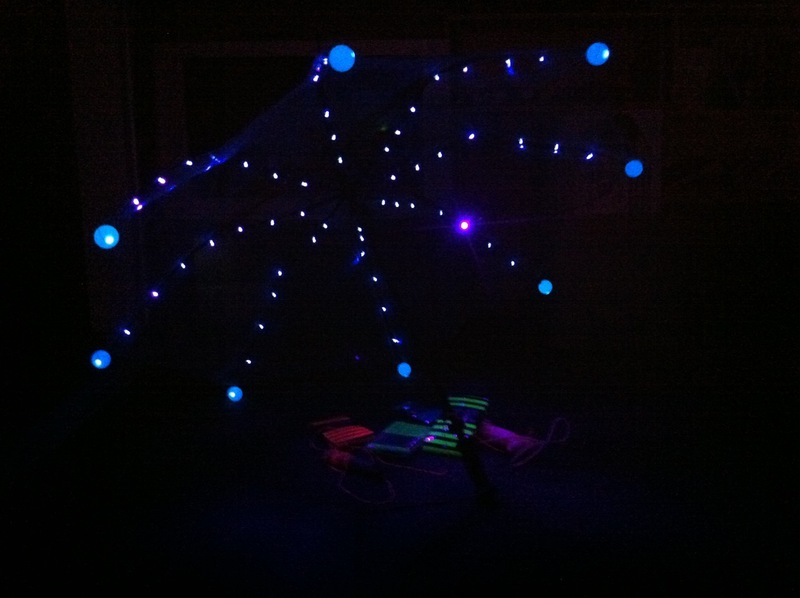 The dance floor was pretty cool, but it was way too heavy, and I wanted a programmable LED array. So I made it ultra-portable by building it on an umbrella frame. 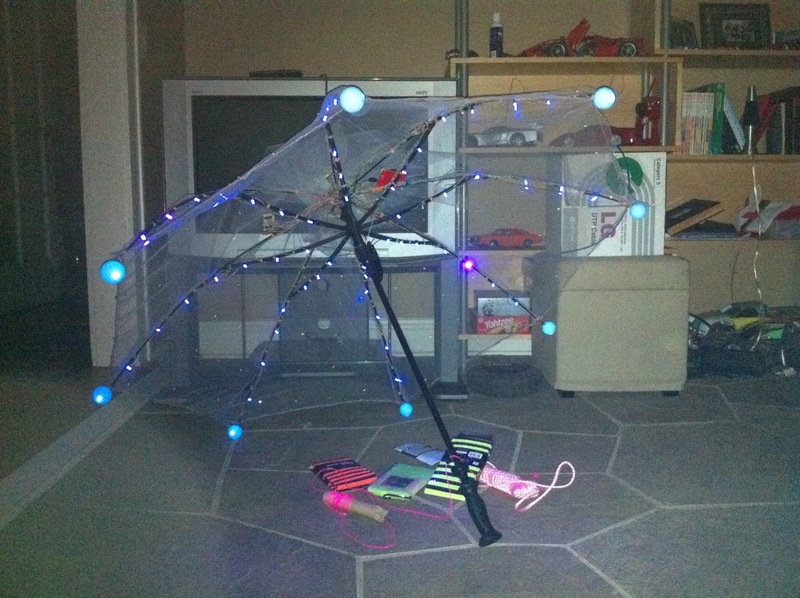 The umbrella sports 64 UV LEDs so I'll have to incorporate neon colors into everything Rebecca and I wear. Each spine has 8 LEDs connected to an 8-bit shift register. All of the shift registers are connected to each other in series, and an arduino microcrontroller (the red board) shifts 64-bit values through them to update the light pattern. I've written a few different programs to try different effects. Some twinkle the lights at random, others shift patterns down or around the spines. I'll combine them into one program that rotates through all of the patterns periodically. It took about 6 days to build. 64 LEDs, 64 resistors, 64 pairs of wires. The fabric cover took about a day. The extra frilly stuff on top is to slightly-more obscure the nest of wires and perf board. Ping-pong balls on the tips are for safety (I don't want to poke any eyes out) and sort of an homage to the greatest LED light-show ever, the Cubatron (it's rad). I'm using a li-ion mobile phone recharger pack as a power supply. It ran the umbrella for about 3 hours on a partial charge. They're $10 on closeout at radioshack, so I'll get a few more.